In recent years, the American school system has been undergoing a revision of curriculum guidelines, standards and benchmarks with an eye towards improving student performance, particularly in the areas of science, math, engineering and technology and the relationships between these areas. Research shows that the average American high school student places 12th in his/her understanding of complex science, math, engineering and technology concepts as compared to students in other countries globally. Aimee Daigle and Steve Cooper - "Riverside Secondary"
Another goal of the DiscoverHover program is to develop concurrently with the American curriculum-based program a global-based program utilizing curriculum standards for those countries which express specific desires to participate in the DiscoverHover program. As specific countries become involved, the core base program will be updated to reflect the current curriculum standards to which each country's educational system adheres. Eventually, the DiscoverHover program seeks to have available an on-demand program suitable to all nations of the world. The DiscoverHover Build-a-Hovercraft School Project involves a hands-on approach to education, which allows for the use of hovercraft and their underlying technologies as a medium for conveying science, math, engineering and technology concepts in a unique and innovative manner while creating an environment in which teachers and students work together as active learners. 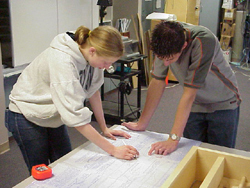 In addition, while students are engaged in learning about the scientific principles, concepts, math, engineering principles and technology involved in this project, teachers are working with their colleagues to expand their knowledge about science teaching in general, and engineering and technology teaching specifically. The curriculum materials, lesson plans, experiments and supporting materials provided in this program will allow teachers to "adapt and design curricula to meet the interests, knowledge, understanding, abilities, and experiences of their students." In addition, this program will allow teachers to "develop a framework of yearlong and short-term goals for students" by involving them in a project which will challenge them not only to solve short-term goals in construction of their hovercraft but also will provide a yearlong goal in the integration of science, mathematics and engineering into a single project which will then be put to the test in the HoverWorld Expo 2004 Endurance Race at Canberra, Australia in December. 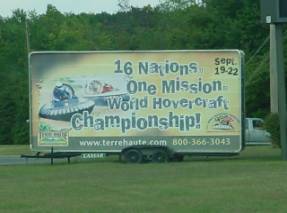 (US National Science Education Standards: Teaching Standard A) (Unfortunately, HoverWorld Expo has been cancelled). Teachers of science need to have a significant role in the process by which decisions are made concerning the allocation of time and resources to various subject areas. However, to assume this responsibility, schools and districts must provide teachers with the opportunity to be leaders. The DiscoverHover Build-a-Hovercraft School Project will afford teachers with the opportunity to assume a leadership role in their community by becoming involved in both a nationally and internationally recognized program. As an example of the program's success, an examination of the prototype program is useful. 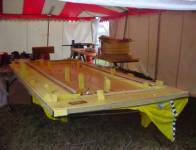 During the 2002 World Hovercraft Championship, which was held in Terre Haute, Indiana in September of 2002, two competing high schools were selected as participants in this program. These schools were North Vigo High School and South Vigo High School, located in Terre Haute, Indiana, USA. Six students from each school were selected to form a team. 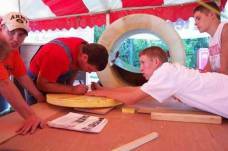 For the first two days, each team of six students worked on aspects of hovercraft construction. Following these two days, both teams were brought together to work cooperatively towards completion of said hovercraft. This program was followed closely by educators from numerous schools in the region that were looking to duplicate this style of program. 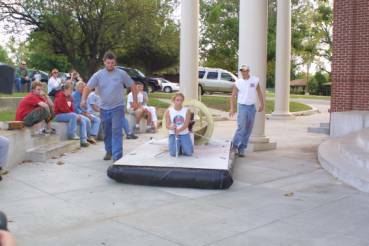 In addition, participants from the 2002 World Hovercraft Championship, as well as the local public followed this program with great interest. Despite foul weather and the occasional personality conflicts that invariably crop up in any type of program of this nature, the students were able to complete the project in four days and operate the hovercraft during the awards ceremony at the conclusion of the 2002 World Hovercraft Championship. Subsequent work by the students at their own respective schools following the "Build a Hovercraft" program has demonstrated that the goal of this program was achieved; that being to foster a greater understanding of science and technology, to foster greater teamwork and cooperation among competitors and to promote science and mathematics among our youth.